Oslo-based Soundrop became the first Spotify app to attract major funding Tuesday with $3 million a Series A round from original Spotify investor Northzone, a step that further underscores how important discovery is to music subscription services. Soundrop launched as part of Spotify’s first slate of apps late last year, offering users to join genre- and band-based listening rooms that can be collaboratively programmed. Think Turntable.fm, but without the gimmicky animations and with the power of Spotify’s catalog. Soundrop has been doing well on Spotify’s app platform, with users playing 60 million songs in its more than 7,000 rooms in May alone. Soundrop co-founder and CEO Inge Sandvik attributed much of this success to one of the key problems a service like Spotify has: It’s great when you know what you want to listen to – but doesn’t expose new music very well. That leads to many people resorting to old favorites instead of discovering new music. “They are listening to the same thing that they have listened to all along,” he said, adding that this wouldn’t warrant paying $10 a month for most people. Sandvik told me that his company launched all the way back in 2008 with the idea to build Spotify playlists for local bars and coffee shops, something he compared to the idea of the diner jukebox catapulted into the 21st century. Soundrop originally hacked this together based on Spotify’s API, but then launched a much more ambitious take on social music discovery on top of Spotify’s app platform in November. 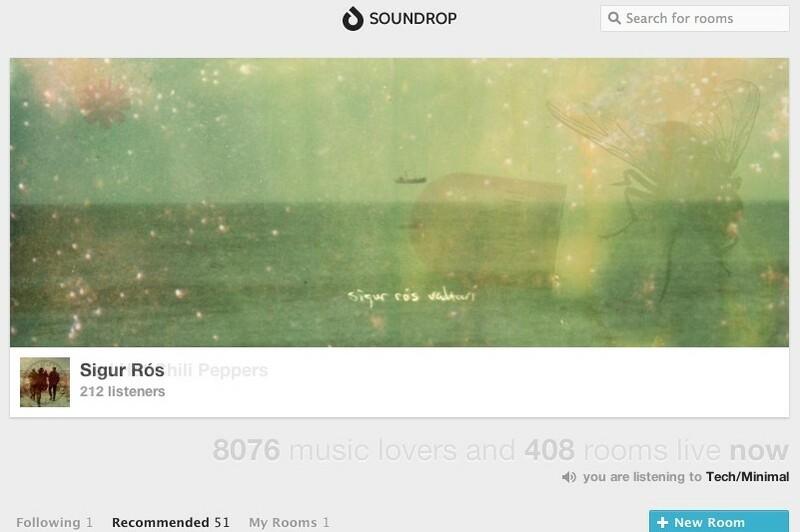 After concentrating on genre-based rooms first, Soundrop gradually added personalized and private rooms as well as band rooms. Just a few days ago, it officially launched a DJ mode, making it possible for bands and DJs to program their own rooms. One of the first artists to take advantage of this was a duo of Swedish house DJs, who attracted some 80,000 listeners. But Soundrop’s plans don’t stop with the addition of new listening rooms. The company is also thinking about supercharging other apps on Spotify, many of which could use some help, according to Sandvik. “They are still playlists with a skin on it,” he explained. A forthcoming Soundrop API could help other to make their music apps social and collaborative as well. Soundrop also plans to extend its reach to the web, allowing users to join rooms outside of the Spotify client. “Our rooms should be able to be embedded everywhere,” Sandvik explained. Of course, that makes even more sense if users can also play music without having access to Spotify, which is why the company is exploring to plug into other services as well. Some of that may even bring videos to Soundrop. “YouTube (s GOOG) is a fantastic music service,” said Sandvik. Soundrop has been bootstrapped until its Series A funding. Its team currently consists of eight people, and Sandvik said that he wants to moderately grow staff to 10 to 12 people.